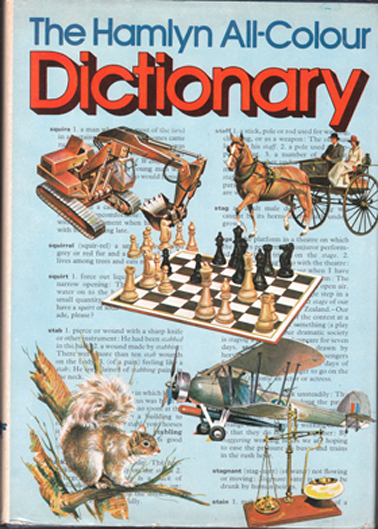 Description: Wonderful dictionary packed full of charmingly nostalgic, full-colour illustrations – depictions of the television set and computer are particularly good! There is an erratum on the last page: the heading zither has been truncated to ther, though its definition remains unaffected. The jacket has been price-clipped, and has a small 1″ (2½ cm) tear at the rear. There are also some negligible tears on the rear flap where it covers the edge of the board. Other than that, the jacket is in good condition. The book itself is in very good condition. The pages are clean, bright, and uncreased. Measures 26.5 cm × 18 cm (10.6″ × 7.2″). 4to. 398 pp.